My name is Becket Rumsey and there are lots of important people in my life who I talk to every day. For starters: my seven-year-old bug-collecting brother, Billy, is one of them (although he talks nonsense ninety-nine percent of the time - and the other one percent? Utter nonsense). Dad, who delivers fish from The Godfather van, is another. Becket has no idea why his dad takes him and his brother Billy to a new home in the middle of the night. But he's determined to find out. So Becket sets out on a journey of discovery with Billy, a snail called Brian and a Jedi Knight. It's not plain sailing but then what journeys ever are? Lara Williamson writes quiet stories with a BIG VOICE! Her main characters are so unique they practically explode out of the book. In this book we meet Becket Rumsey, whose voice is heartwarming, poignant at times, yet also extremely funny. 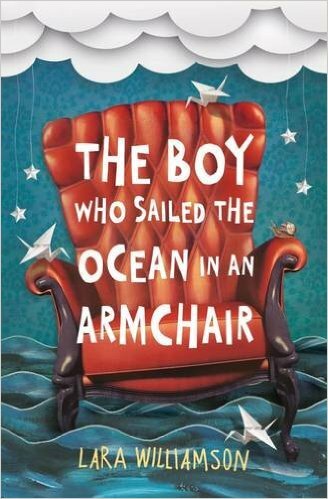 His brother, Billy and his pet snail, are brilliantly written characters too. You find yourself wanting to hug them all. I absolutely adore the way that Lara writes. In fact, her comical voice is so unique, from now on I shall refer to her turns of phrase as Laraisms! 'Sweet Baby Cheeses' has already become an addition to my conversations. And let's not forget Williamson's hilarious choice of business names - Crops and Bobbers, the hairdressers, Burger She Wrote, the burger bar and The Codfather, Dad's fish delivery service. Where does she get her ideas from? Lara excels at writing stories that walk a fine line between humour and sadness. One minute, you are wiping a sad tear away, the next you're crying with laughter. This story has a surprising twist, which I didn't see coming. You'll discover the story doesn't go the way you think it will. Being a big fan of magical realism, it was fantastic to find it within this story. I loved the story about the origami cranes and how it was weaved into the main story. I also love the idea of butterflies being loved ones who come back to us. I really think Lara Williamson has outdone herself with her second novel and I can't wait for more from her in the future. This will be a firm favourite within the Middle Grade market and an ideal book for children who are grieving for a loved one. Don't be surprised if this book wins awards over the next year.